Look below for the newest listings available online at the moment for heart signet ring in Women's Jewellery and Clothing Accessories including these related brands: AMANDA COLEMAN, STYLEROCKS, STAR WEDDING RINGS. To refine your heart signet ring suspects you could use our sort, refine by category, find comparisons or even view Amazon products, or set a price range by using PriceInspector's search bar at the top. When you have finished your detective work, you will probably get the best price on your Women's Jewellery products. 9ct Gold Cubic Zirconia Heart Signet Ring R2983L Swirls of 9ct gold on the shoulders lead to the 7mm heart with a cubic zirconia shining out from its centre. 9ct Gold Cubic Zirconia Heart Signet Ring R2983M Swirls of 9ct gold on the shoulders lead to the 7mm heart with a cubic zirconia shining out from its centre. 9ct Gold Cubic Zirconia Heart Signet Ring R2983N Swirls of 9ct gold on the shoulders lead to the 7mm heart with a cubic zirconia shining out from its centre. 9ct Gold Cubic Zirconia Heart Signet Ring R2983O Swirls of 9ct gold on the shoulders lead to the 7mm heart with a cubic zirconia shining out from its centre. 9ct Gold Cubic Zirconia Heart Signet Ring R2983P Swirls of 9ct gold on the shoulders lead to the 7mm heart with a cubic zirconia shining out from its centre. 9ct Gold Cubic Zirconia Heart Signet Ring R2983Q Swirls of 9ct gold on the shoulders lead to the 7mm heart with a cubic zirconia shining out from its centre. 9ct Gold Cubic Zirconia Heart Signet Ring R2983S Swirls of 9ct gold on the shoulders lead to the 7mm heart with a cubic zirconia shining out from its centre. 9ct Gold Onyx Signet Ring R2944L A 7mm black onyx heart sits at the centre of this 9ct gold signet ring with a curlicue pattern around the shoulders. Made in the UK. 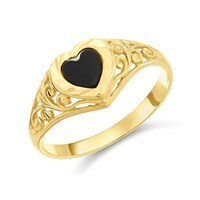 9ct Gold Onyx Signet Ring R2944M A 7mm black onyx heart sits at the centre of this 9ct gold signet ring with a curlicue pattern around the shoulders. Made in the UK. 9ct Gold Onyx Signet Ring R2944N A 7mm black onyx heart sits at the centre of this 9ct gold signet ring with a curlicue pattern around the shoulders. Made in the UK. 9ct Gold Onyx Signet Ring R2944O A 7mm black onyx heart sits at the centre of this 9ct gold signet ring with a curlicue pattern around the shoulders. Made in the UK. 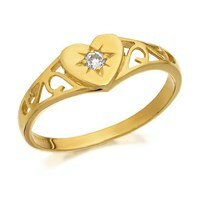 9ct gold heartshaped signet ring A classic ladies' signet ring in a heart-shaped design with pretty engraving detail. Crafted in 9ct yellow gold.